22 • FOODSERVICE EQUIPMENT & SUPPLIES • SEPTEMBER 2017 operator's opinion able to make the process more consis- tent. Reduction of our water usage and labor were just an added bonus for us. The Result As a result of implementing this solu- tion, Five Guys has realized a much more consistent process when it comes to pre- paring our potatoes. We've also reduced water consumption by 50 percent for the whole store. Time required to complete the process of washing a bag of potatoes has dropped by about 50 percent. In some instances, the water would run over the potatoes all day, and that led to pretty heavy water consump- tion. With this new product, it's all about filling that powered washing bay once. We've taken the water needed for prepping one bag of potatoes from 150 gallons to a max of 40 or 50 gallons to get it clean. While the potatoes are cleaning, staff can do something else, which further maximizes labor. And because this represents a more durable solution than before, our costs associated with repairing the po- tato cutter and sink have declined. We've retrofit- ted all 450 Five Guys corporate locations, first targeting water-sensitive markets, like Southern California, Phoenix and even Georgia. In reviewing our bills from the stores we saw a steady and consis- tent decline in water consumption. As a result, payback on these units is better where water, labor and potatoes are more expensive. For markets such as Cali- fornia and Arizona, we were at a 14- to 16-month payback. On the East Coast, the market dynamics were slightly differ- ent but the payback was the same. 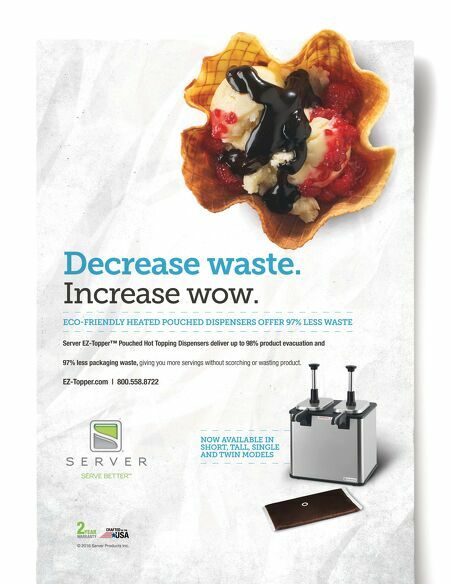 New Restaurant Protocol We have also come to realize that the water savings has made it more cost effective for Five Guys to open new restaurants. In many markets, the mu- nicipalities will ask to review existing restaurant's water and sewer bills. This used to lead municipalities to assess large impact fees. This solution has really helped negate that issue for us given that our impact on the water and sewer system has been reduced by half. Given that our network includes plenty of franchisees, adding a new piece of equipment and cost to the store pack- age will always be a sensitive issue. Once franchisees were able to try that first sink, they quickly climbed on board. One fran- chisee tested the sink and converted all 22 of his stores immediately. At first it was all about consistency of the product. They called months later when the bills came in to confirm that they were definitely happy with the water savings, too. Developing custom solutions offers great potential for concepts like Five Guys, but success in a project like this really is all about the people. In this instance, we were able to realize even more success than we had originally en- visioned, thanks to the skilled, driven and organized team that the manufacturer formed with us. 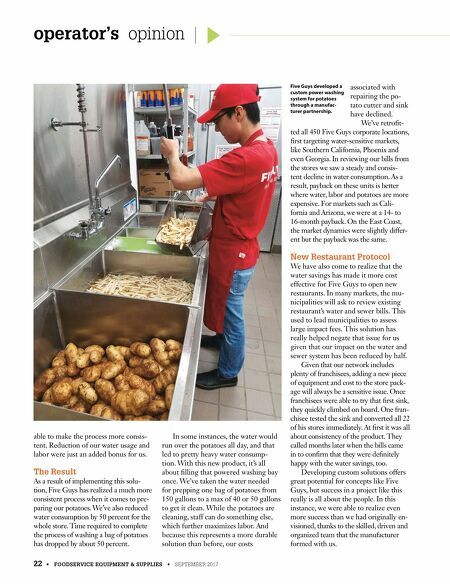 Five Guys developed a custom power washing system for potatoes through a manufac- turer partnership.